Games, rhymes and riddles for children and their parents too! use the puzzles as a coloring book too! A new puzzle debuts each week. 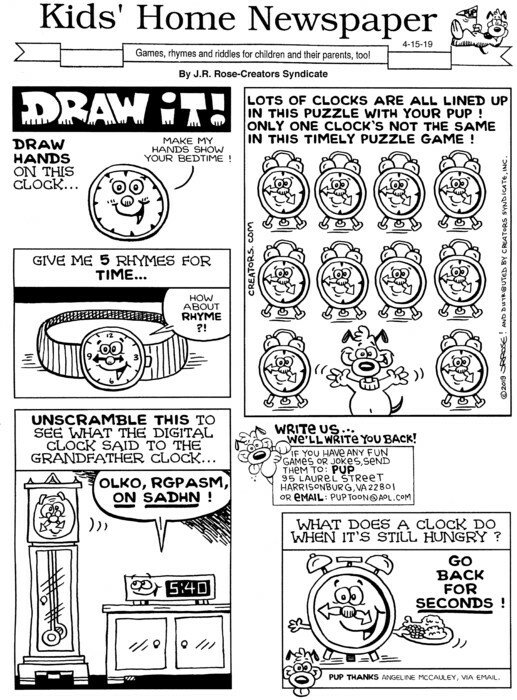 Creator John Rose always wanted to be a cartoonist. He started drawing on his parents' living room walls and continued throughout his school years in the margins of his test papers (hoping for extra credit). The Virginia-born Rose graduated from James Madison University in 1986 with a bachelor's degree in art and art history. After graduation, he drew freelance sports cartoons for newspapers in Manassas, Va. He joined Byrd Newspapers of Virginia in 1988, starting at the Warren Sentinel in Front Royal and then moving to the Harrisonburg Daily News-Record where he continues to work today. His cartoons have won awards from the National Newspaper Association and the Virginia Press Association. 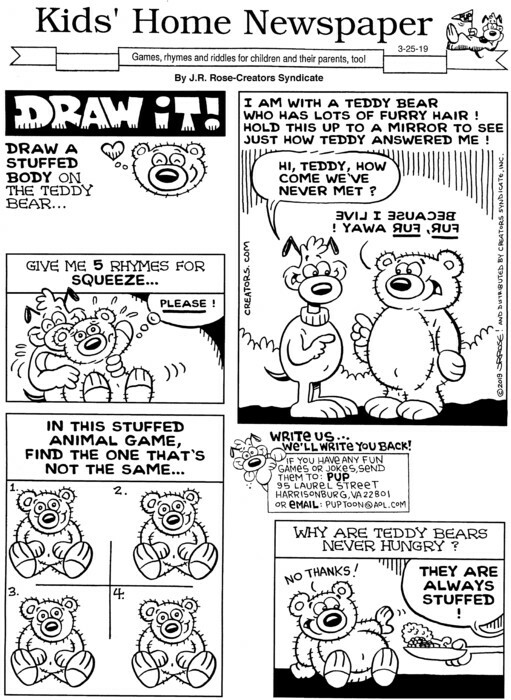 Rose also creates Kids' Home Newspaper, a weekly children's cartoon/activity page for Creators Syndicate. 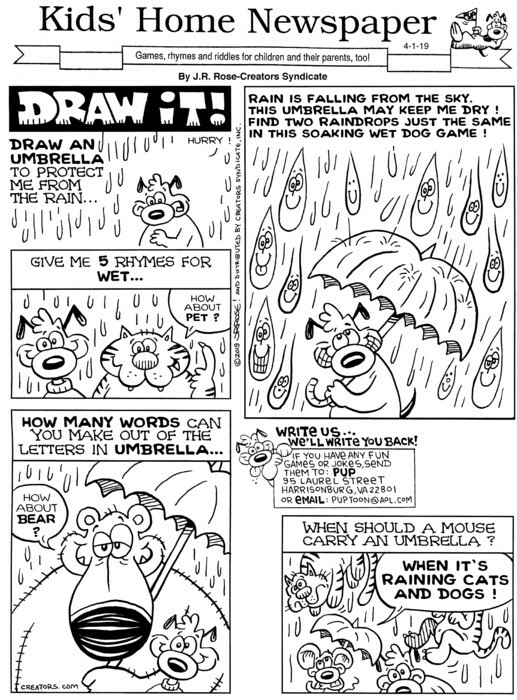 Syndicated since 1991, this feature has spawned three activity books: "Fun With Pup!" 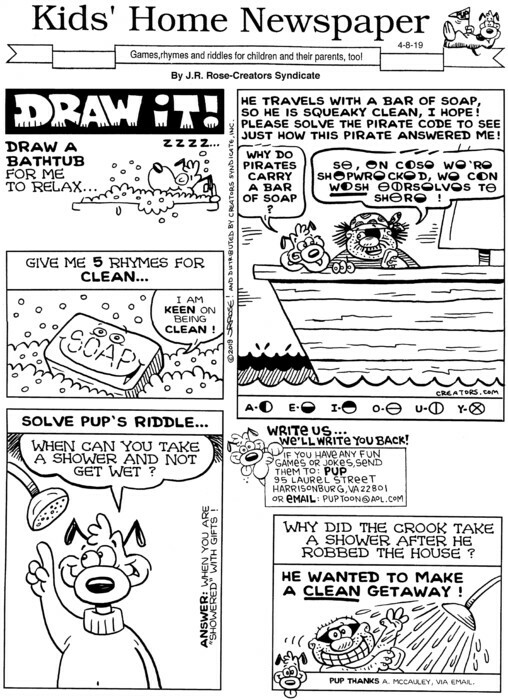 (1996), "More Fun With Pup!" (1998) and "Christmas Fun With Pup!" (2000), all published by Pelican Publishing Co. The feature's e-mail address is [email protected] Rose is a member of both the National Cartoonists Society and the Association of American Editorial Cartoonists. He lives with his wife, Karen, and daughters, Meredith and Sarah, in the mountains of Harrisonburg, Va. In his free time, he enjoys spending time with his family, freshwater fishing and eating pizza.